Set among the serene and beautiful surroundings of Kundanbagh, Begumpet, perched on the top of a small hillock, is a remarkably pleasing and captivating structure of Chinmaya Dhyana Nilayam. Pujya Gurudev had himself approved its design. 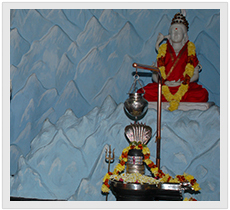 Sandeepany Kailash has become a famous landmark in the twin cities of Hyderabad and Secunderabad. The building itself is in the form of Lord Shiva, the formless, Absolute Reality, which is the nature of pure Consciousness. Inside, a beautifully carved marble murti, of Lord Shiva, the Lord of the Universe, the Creator, the Sustainer and Destroyer, whose presence transforms the body into a beautiful and holy thing, had been installed and consecrated on Mahashivaratri Day, 14th February 1999 by Pujya Swami Tejomayananda, amidst the blowing of conch shell and the resounding reverberation of the chanting of 'Om Namah Shivaya'. The Kumbhabhishekam was performed by thousands of devotees. Sandeepany Kailash has come to stay and bless the world.